Annapolis, Maryland's capital city, is a picturesque and historic Chesapeake port town. Walking through the city and along the waterfront still gives one the feel of centuries of Bay traditions. Like the personal touch when visiting a new place? Stop by our Visitors Center at 26 West Street in Annapolis or our satellite Visitor Information Booth at City Dock. Our trained volunteer information specialists can answer your questions, make recommendations, provide you with event calendars and brochures, and help map out an itinerary that's perfect for you. Conveniently located adjacent to Gott's Court parking garage in Annapolis's Historic District, the center is within easy walking distance of shops along Main and West Streets, Maryland Avenue, and State Circle. The U.S. Naval Academy, Maryland State House, William Paca House and Garden, Hammond-Harwood House, Chase-Lloyd House, Charles Carroll House, Historic Annapolis Foundation Museum, and the Banneker-Douglass Museum are all within walking distance. It is also a convenient starting point for a variety of tours including the Discover Annapolis Trolley Tour and Watermark's Four Centuries Walking Tour. The West Street Visitors Center is open daily from 9:00 a.m. until 5:00 p.m., except on Thanksgiving, Christmas, and New Year's Day. The satellite Visitor Information Booth at City Dock is open daily March through October from 9:00 a.m. until 5:00 p.m.
Stop by the primary visitor center on West Street for displays that highlight the Chesapeake Bay with particular emphasis on the ways that the visitor can access the Bay via boat tours, rental and charters. There are also several tours of the town of Annapolis that leave from the main visitor center. Tours include the Discover Annapolis Tours, a tour of Annapolis by minibus, and the Annapolis Walkabout, architectural history walking tours of the historic district and U.S. Naval Academy. For more information on tours and other attractions, visit the Annapolis and Anne Arundel visitor web page at www.visit-annapolis.org. 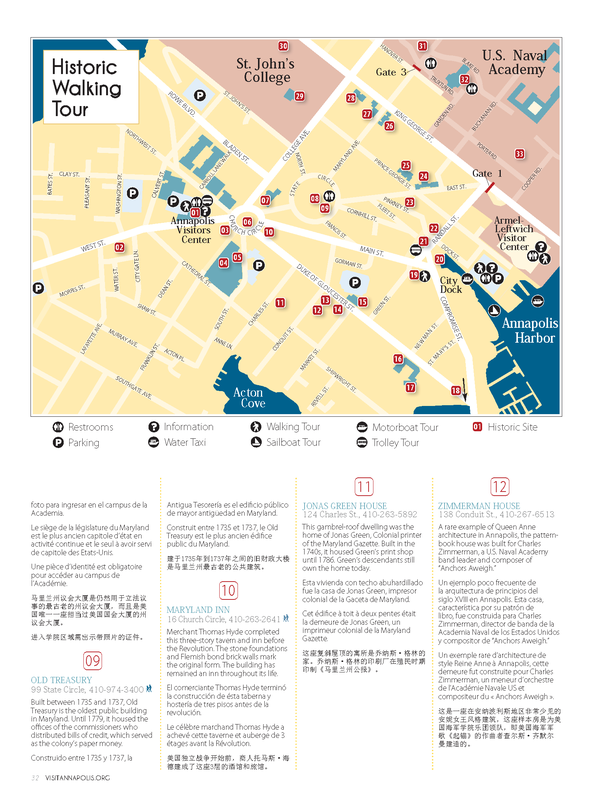 Learn about boat and walking tours, picking up a map, and touching base for recommendations on accommodations, restaurants, shopping, and attractions. The visitor center and information booth provide brochures and maps on many bay-related sites and attractions in the Annapolis, Maryland area. Current and up-to-date information is available on visitor accommodations, restaurants, recreational activities including fishing and golf, marinas, historical landmarks, upcoming events and festivals, antiquing and shopping. Tickets for several area tours may also be purchased at the main visitor center location. The visitor center and the information booth on City Dock are both wheelchair accessible. A Museum without Walls, Maryland's capital city is a lively, upbeat, contemporary city where four centuries of architecture embrace 21st -century living. Check out our trendy boutiques and specialty shops as you stroll amidst more 18th-century brick buildings than anywhere else in the country. Come celebrate Annapolis and the Chesapeake Bay's rich maritime history. Enjoy fresh-from-the-Bay seafood in restaurants ranging from simple to sublime. Cruise the Annapolis Harbor; visit our City Dock; catch the 4000-strong Brigade of Midshipmen in noon formation at the U.S. Naval Academy; visit Maryland's official repository for African-American heritage, the Bannker-Douglass Museum, or the dedicated people at the Historic Annapolis Foundation.